Perfect Fit:Responsive buttons boost overall functionality of your device, features precise port cut-outs for perfect compatibility. Full Protection:All-round fit keeps your iwatch a full protection with shock absorption technology. Easy Installation:Align your iwatch with the case and snap your iwatch into place by pushing into each corner. Lightweight Design:The slim, bulk-free design allows easy access into and out of your iwatch. Anjoo is a fast-growing brand. We are dedicated to providing high-quality products, satisfying our customers. We offer perfect pre-sales and post-sales services, based on 2-year warranty for our products. Contact us for replacement or refund at any time if you meet any problem. We will respond to you within 24 hours with best solutions. SLIM & : VARIOUS: The cases with slim design and various colors can match all kinds of apple watch bands. 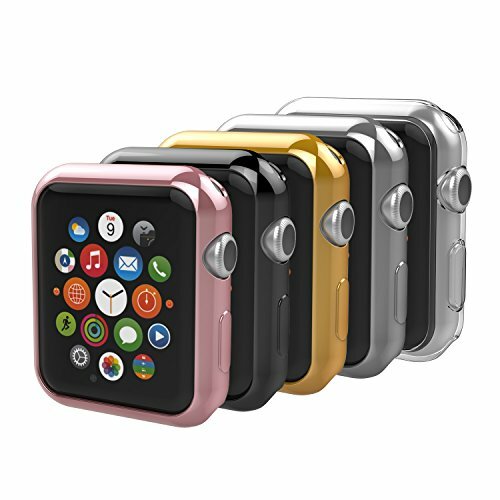 With the cases, you can change the color of your iwatch as you like. PERFECT FIT: Responsive buttons boost overall functionality of your iwatch, features precise port cut-outs for perfect compatibility. You can directly charge your watch with the case. PREMIUM Soft TPU keeps your iwatch scratch-free and lightweight. Simplified buttons & quick responsiveness. SHOCKPROOF: This case covers the curved edges of the iwatch, offer full protection for your apple watch to against scratching, dropping and bumping. If you have any questions about this product by Anjoo, contact us by completing and submitting the form below. If you are looking for a specif part number, please include it with your message.